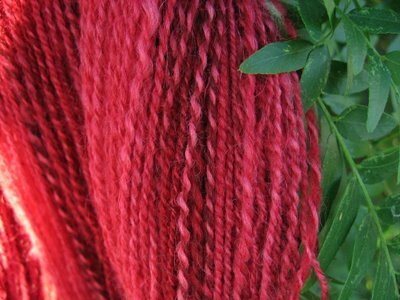 My red yarn is dry, and in skeins, and look at it! Just look at it! 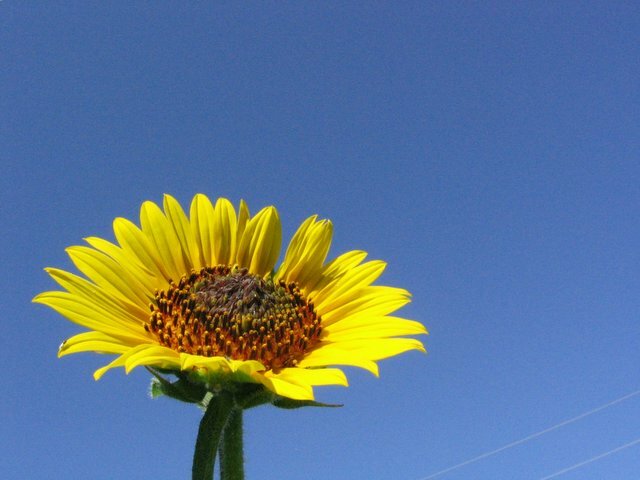 It's pretty, yes? My friend, Peggy, dyed this for me - varying shades of red - and look at it! I love the barberpole parts! 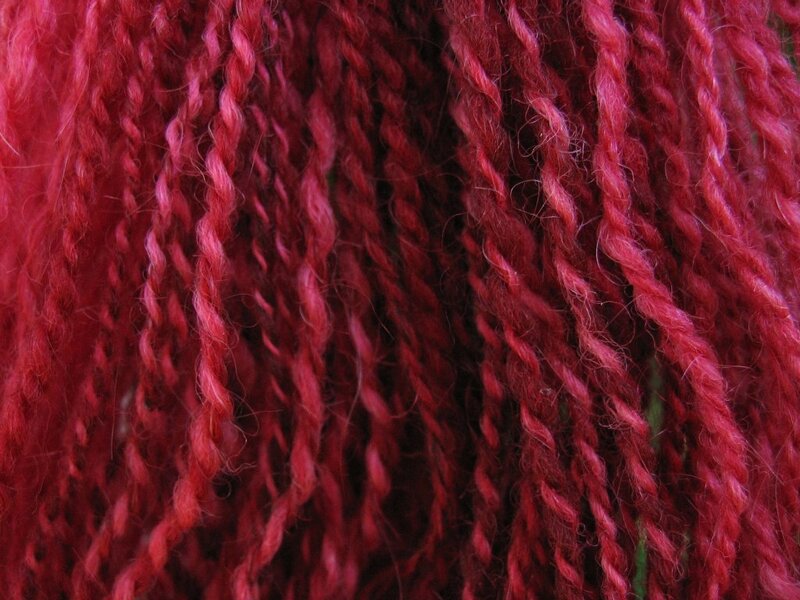 Most of the yarn is a nice, medium red, but some parts are a really deep red, and look how it looks plied! I'm so happy that I decided to use this 2-ply method, because it came out really pretty. I can't wait to spin the rest of this batch of roving, and then.... get knitting! I resisted and resisted and RESISTED learning how to spin. Why? It's a blast! I'm glad that I finally gave in. i had a quick "?" about the k'ne spindle i have one made but i have no ide4a how to use it because it doesnt have a hook at the top. How do i use this awesome spindle. I'd love to answer your question, but you left me no email address? Email me, and I can tell you more. If you scroll down, you can see a picture of the Knex spindle, at the reservoir? The black thing at the top functions as the hook. I just catch the single in the place where the black thing hooks to the grey bar - there's the tiniest of slots, there. Or, I mostly use it as a support spindle. It's all described lower down in my blog. 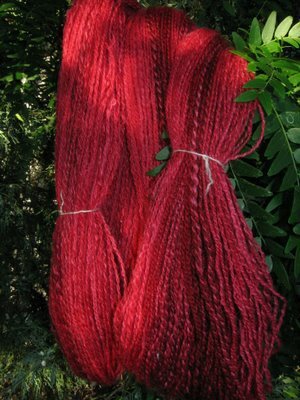 Gorgeous red yarn! It turned out really pretty and the dye job is perfect. Spin on! Rosemary, what a wonderful job of spinning and plying you did. Like you I'm new at it too. I'm still spinning my yarn then I'll be ready to ply so you're way ahead of me. Thanks so much for sharing all your experiences. I'm learning from you! Beautiful yarn! Thanks for your response on the Spindlers list - I'd found your blog earlier today just searching around for resources on how to Andean Ply and saw your book experiment. I would have tried it, but I couldn't find a popsicle stick! Next time, though!! That IS lovely yarn!! I love the color!! 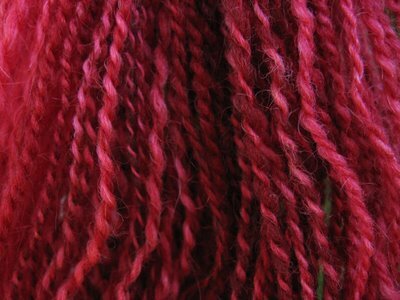 Your yarn is absolutely gorgeous, and so is the plying! And this with a spindle - I'm seriously awed. And the red color speaks to me - any more roving where this came from...?